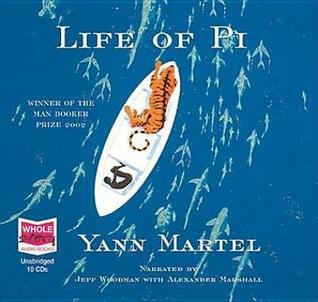 After the tragic sinking of a cargo ship in the Pacific, one solitary lifeboat remains, carrying a hyena, a zebra, a female orangutan, a Bengal tiger, and a 16-year-old Indian boy named Pi. His story is a dazzling work of imagination that will delight and astound listeners in equal measure. This book has been on my bookshelf for a long time, even before the movie came out. I own the paperback, but I decided to listen to the audiobook since my library had it on Overdrive. Piscine "Pi" Patel, a teenage boy, and his parents are bound to emigrate from India to Canada. Pi's father, who ran a zoo in Pondicherry, sold off the animals and some were put on the same ship bound for Canada that Pi's family was travelling on. The ship goes down, and Pi is thrown into a lifeboat. He sees someone he knows, Richard Parker, paddling in the water. He encourages Richard Parker not to give up and to try to reach the lifeboat. Richard Parker makes it, and that's when Pi realizes what he's done...he's now onboard with a Bengal tiger! They are not alone. Pi also discovers a wounded zebra and a hyena and, later, a orangutan. In the Author's Note in the beginning of the story, he says that this story was relayed to him by someone he met in a coffee shop. I wasn't sure what I expected, but this wasn't at all what I was expecting...and I mean that in a good way. It's always a pleasant surprise when a book exceeds your expectations, and Martel's creative storytelling made this a highly enjoyable read. This is my first book by this author, but I am definitely planning to read more from him. "It's important in life to conclude things properly. Only then can you let go. Otherwise you are left with words you should have said but never did, and your heart is heavy with remorse." 4 stars!! It was really good, and you should put it on your TBR.